The exceptionalism that is applied to people involved in Hunting, throughout the UK, is staggering. While regular members of public can expect to be pulled over, reprimanded and potentially fined for road traffic offences, such as driving without due care and attention or using a mobile device while at the wheel, people engaged in hunting are repeatedly getting away with serious and dangerous offences. It really is only a matter of time before someone is seriously injured or killed as a result. Here’s a recent example from Hampshire, recorded on the 5th of January. This video was shared with Hampshire Police with the expectation that they would take this matter seriously and at least speak to the people involved. But Hampshire Police have assured the people who submitted the video, recorded from their vehicle, that ‘no crime was committed by this driver’. In the video the driver can be clearly seen with both hands released from the steering wheel while he uses is mobile phone. He reaches out of the window with both hands in order to get a clear view of the vehicle in front for his camera. He can then be seen resting his hands on the steering wheel with his camera phone completely blocking his forward view. He is clearly failing to maintain an adequate distance between his vehicle (K554 XMG) and vehicle in front and his passenger repeatedly makes threatening and offensive hand gestures. It’s illegal to hold a phone or sat nav while driving or riding a motorcycle. Yet Hampshire Police have stated: ‘no crime was committed by this driver’. This should be of interest to anyone in Hampshire who has been, or maybe in the future, fined for traffic offences related to using a mobile phone as it sets a very clear precedent. 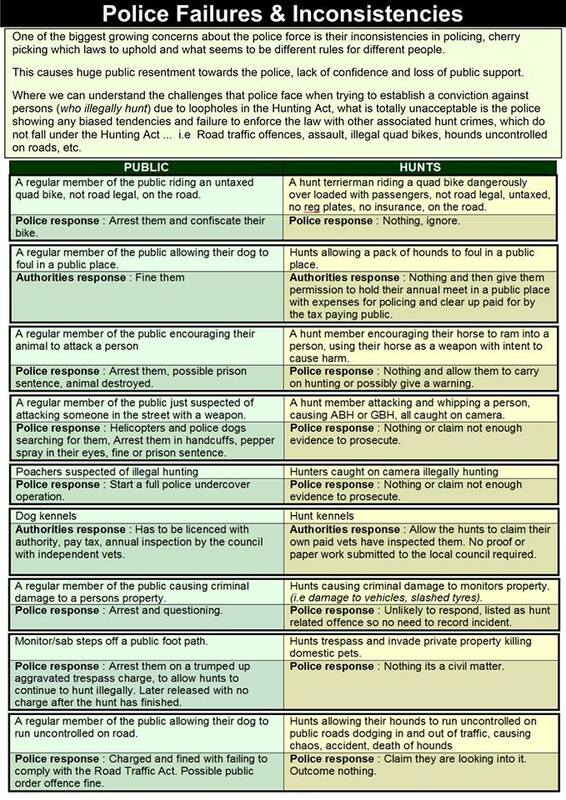 The following comparison summary starkly highlights many examples of inconsistencies in policing wherein Hunts and hunt supporters are routinely afforded special treatment. Numerous, verifiable examples exist of all of these listed policing inconsistencies. 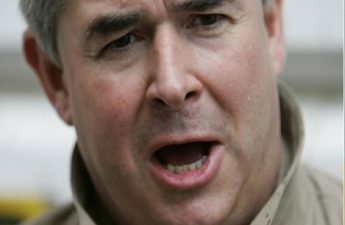 Hunts and their cronies are being allowed to overtly break the law without fear of any police investigation. 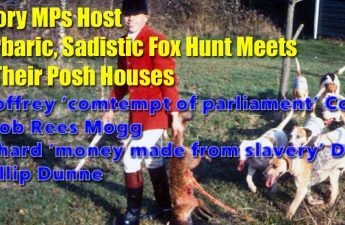 While it is widely understood that the 2004 Hunting Act is very ineffective and difficult to apply that does not explain why Police forces are failing to investigate and enforce other crimes such as violent assault, threatening behaviour, intimidation, criminal damage, road traffic crimes, trespass and allowing their hounds to wander and foul wherever they like. 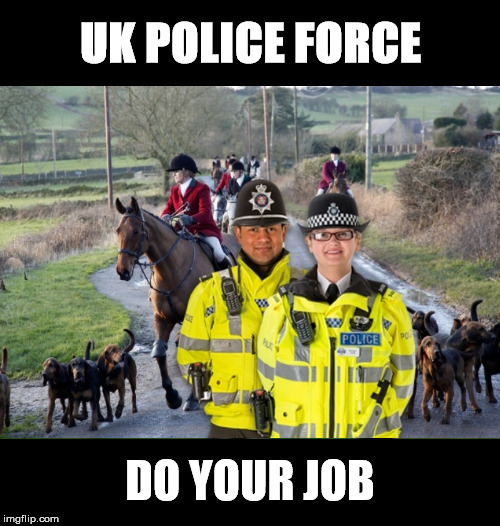 Hunt monitoring and wildlife groups throughout the UK do their best to do what the Police should be doing. They monitor and record many examples of law-breaking committed by Hunts every week throughout the hunting season and report them all to the Police. So there is now a huge and growing amount of data which clearly shows that UK Police forces are failing in their duty to protect people and property! Time for a public enquiry!